Wales boss Chris Coleman says "all thoughts" are with Republic of Ireland defender Seamus Coleman after he broke his leg during Friday's 0-0 draw. 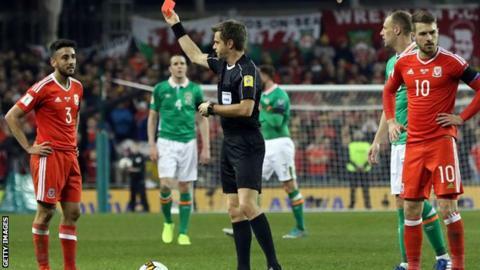 The World Cup qualifying stalemate will be remembered for the foul on Everton defender Coleman that led to Neil Taylor receiving a straight red card. "First and foremost, the most important thing is Seamus Coleman. We are told that it is not so good which we are sorry for," the Wales boss said. "Seamus is the most important thing." Coleman defended Aston Villa defender Taylor on a costly night for Wales where a booking for Gareth Bale ruled him out of Wales' next qualifier, in Serbia on 11 June. "Neil Taylor is not really that type of player but it's a tough one for Seamus," Coleman said. "Neil is in the dressing room, he's despondent. If he's got it wrong, he is not that type of player, he's had a serious injury himself." Coleman felt his side were in the ascendency before being reduced to 10 men. The point leaves Wales four points behind the Republic of Ireland and Serbia as Group D reaches the halfway stage, having drawn four of their five matches. "With 11 v 11 I thought we controlled the game really and looked like we were going to create something and score," Coleman told Sky Sports. "The red card changes everything, of course. We were up against it for 25 minutes and I am proud of the players that they battled and rolled their sleeves up. "We dug in, we had to show a different side of our game. We went to a defensive block, we had to close the game out and we did that. "The Republic are very strong here at the Aviva Stadium and we expected what we got." Coleman says Wales can still qualify for the 2018 tournament in Russia, even without Bale for their next qualifier, after he picked up a booking that means he is suspended. "There are still five games to play and we are still unbeaten. A couple of draws out of the four and it changes your life, but I can't be too hard on the players," he said. "They have given all they have got, we just need a bit more luck and a bit more quality in the final third. "Losing Gareth in Serbia is a blow, but that is international football. We've had players out for all the qualifiers so far, until this one. "At our best, we know we are a team that can play against anyone and win. Take someone like Gareth Bale out of any team and you will miss that. "We need to find another way, and we will. We still feel we can go to Serbia and bring something back. It will be a good test for us, it is a game we look forward to." Real Madrid forward Bale felt Wales were in control before the red card for Taylor. "They made it very difficult, they are a very physical team and in the first half we didn't really create too much, obviously they made it difficult for us," he explained. "But in the second half we were a lot better and had a lot of chances, we controlled the game really well, I thought. "Obviously the sending off then changed the game. "But the boys fought very hard, I suppose if you play the last 20 with 10 men a point is not too bad. "We were disappointed not to get a goal and we are disappointed not to get the win."